Mosier School student Gabriel Chantre has his irises scanned into a national database as part of the Iris Biometric Technology initiative provided by the Hampshire County Sheriff’s Office and the CHILD project to identify children should they go missing. SOUTH HADLEY – More unique than a fingerprint, the iris of an eye can be used to identify an individual in an instant. Pairing this knowledge with modern technology, the Hampshire County Sheriff’s Office became the first in the state – and nation – to offer Iris Biometric Technology as a tool to safeguard children. Put to use in 2005 by Hampshire County Sheriff Robert J. Garvey in conjunction with the Child Identification and Location Database [CHILD] Project, Iris Biometric Technology essentially captures a detailed, high-resolution picture of a child’s set of irises. The iris is the colored portion of one’s eye, which tears as it grows, forming a distinct pattern. As the iris develops, the color, shape and size of the pattern becomes the print unique to every individual. The information captured by the technology is stored in a secure, national database for missing and exploited children, along with identifying information such as the child’s name, their parents and sibling names, and address. Should a child ever go missing and later be found, officials can scan the child’s irises and retrieve their contact information in seconds. “It’s another tool in the tool box to help identify missing children and get them back to where they need to be,” said David Fenton of the Hampshire County Sheriff’s Office, who was among the Hampshire County Sheriff’s Office officials on hand during a presentation last week at the Mosier and Michael E. Smith Middle schools. 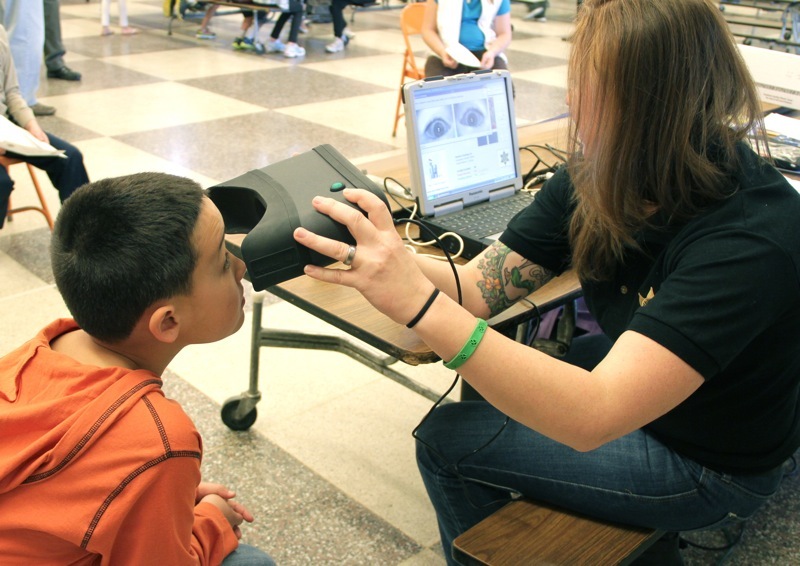 Approximately 180 students from both schools participated in the iris scan, with permission from their parents. The students lined up in the cafeteria and one by one sat with program officials who verified with the children information provided by their parents. Then, the non-invasive iris scanner was held in front of the child’s face.. In a spilt second, the child’s irises were photographed and saved onto a computer. Finally, a plastic identification card was printed out, with a photo of the child and his or her basis contact information. The process took a mere 30 seconds, tops. The program is not just for students. Children as young as 1.5 years old can have their irises scanned. Once a child turns 18 years old, he or she is automatically deleted from the database, but could remain in the system if he or she wished. The program also works on the opposite end of the spectrum with Senior Safety Net Program, in which seniors with a tendency to wander away from their homes can have their irises scanned. Once located by police, the seniors can be identified through the same secure database and promptly returned to their homes. The database spans the nation with its ability to locate an individual anywhere throughout the country. The same high-tech iris-scanning system is also used for inmate recognition in prisons. In some corporations and businesses, it is used to gain entry to places with restricted access as well as to clock in and out of work. Officials from the Hampshire County Sheriff’s Office have visited other schools in the area providing this service free of charge. Most recently, approximately 1,200 students in the Belchertown school systems participated in the program. Additionally, officials offer this service at the tri-county fair. Murphy said interested parents could contact him for information regarding the next iris scan or to schedule a meeting at (413) 584-5911 ext 210. Security theatre. While we’re at it, why don’t we just lo-jack our kids too?